Getting out on the water is one of the best ways of viewing the birds and other wildlife up close. 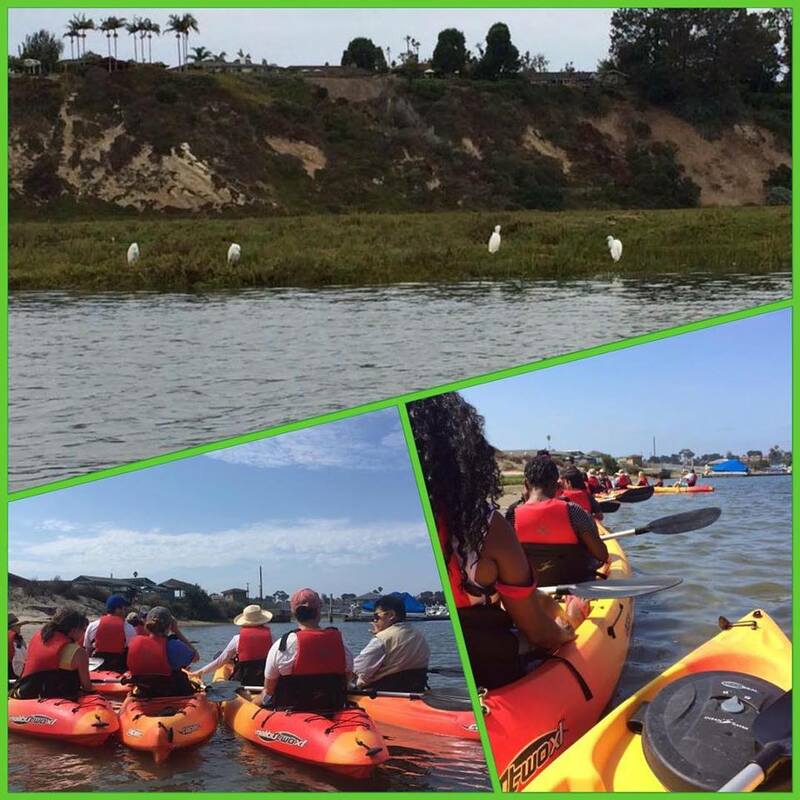 The Newport Bay Conservancy offers a guided kayak tour every Saturday and Sunday morning year-round in partnership with the Newport Aquatic Center located at Northstar Beach. The Newport Aquatic Center also rents kayaks and other craft throughout the week. If you have your own kayak or canoe, we recommend that you launch from Northstar Beach or Lower Castaways Park. There is no launch or parking fee. See Boating Limit Map. Note that no powered watercraft are allowed into the Ecological Reserve without a permit. There are various trails to choose from depending on your interests and preferences. Dogs are allowed in the Nature Preserve but must be on a leash and on designated trails. 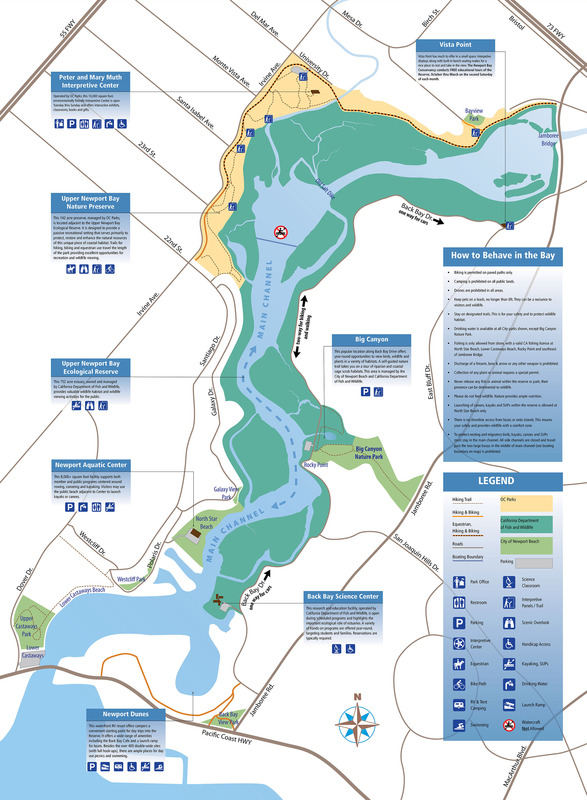 To view a trail map, click here. Back Bay Drive is a multi-use road that stretches 3 miles northwards along the east side of the Bay from the Back Bay Science Center at Shellmaker Road to Vista Point on the corner of Eastbluff Drive. Back Bay Drive is one-way for motor vehicles from south to north. This is the best route if you would like to be close to the water and see shorebirds and waterfowl, but bear in mind that bikes and pedestrians share the road. There is street parking south of Shellmaker Road, at the bottom of San Joaquin Hills Road and on Eastbluff Drive, and a parking lot at Big Canyon. There are scenic pedestrian trails at Big Canyon. There are several bluff-top pedestrian-only trails over on the northwest side of the Bay and these provide some great views overlooking the Bay. The best place to park is at the Interpretive Center on the corner of University Drive and Irvine Avenue. From there you can head south to 23rd Street or east to Bayview Drive and Jamboree Road. There are designated horse trails between 23rd Street and Jamboree Road, but there are no horse rental facilities in the Bay. There is a 10.5 mile bike loop around the Bay. Starting at Jamboree at San Diego Creek and heading clockwise the first stop is Vista Point on the corner of Eastbluff Drive and Back Bay Drive. Take Back Bay Drive to the Newport Dunes Resort. Follow the sign-posted bike path through the resort which brings you out onto Pacific Coast Highway at the bridge. Take the highway over the bridge and turn right on Dover Drive. You can take a quick detour to Castaways Park, Northstar Beach or Galaxy Park or follow the direct route along Dover to Irvine Avenue where you will turn right. On Irvine just beyond Santiago Drive a set of paved trails begin. These take you to the Interpretive Center, and from there to to Bayview Drive and back to Jamboree Road. For a map of entry points and points of interest visit the City of Newport Beach’s website. The 22-mile Mountains to Sea Trail, which runs from Weir Canyon north of Irvine Regional Park joins the Back Bay Loop at Jamboree Road and continues through to Shellmaker Road.